Barry Mirkin is a former chief of the Population Policy Section of the United Nations Population Division. A basket of condoms passed around during International Women’s Day in Manila. / Credit: Kara Santos/IPS. Davao City, PHILIPPINES, Dec 28 2016 (IPS) - With the landslide victory of the tough talking city mayor of Davao City, Roberto Duterte to the Presidency of the Philippines in May 2016, news reports of the South-East Asian country have been dominated by the President’s often controversial statements and policies, especially toward those involved in the illegal drug trade. One such notable event, which slipped below the radar was the granting of a second temporary restraining order in 2016 by the country’s Supreme Court on the distribution of most contraceptives. 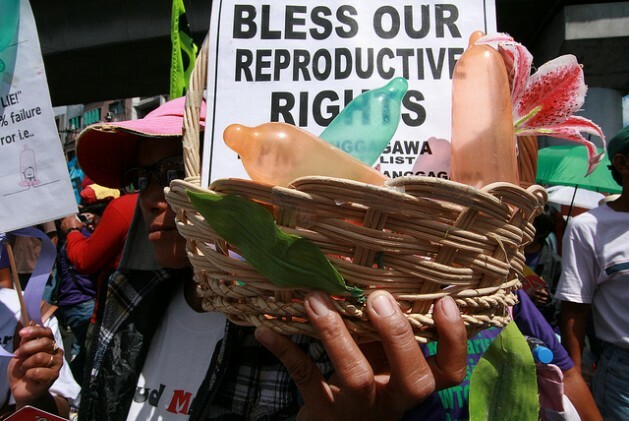 The Philippine Congress had enacted the Reproductive Health Law in 2012, after more than a decade of deliberations. However, its implementation was immediately postponed, while the Supreme Court deliberated on a petition questioning its constitutionality. It was supposed to go into effect in 2014, when the second postponement was issued. In both the 2012 and 2016 restraining orders, a coalition of the country’s powerful Catholic Church and other conservative elements were behind the efforts to overturn the new reproductive health law. The law would have provided public funding for contraceptives for poor women. The Church continues to promote only withdrawal and abstinence, as acceptable methods of family planning in the Philippines. Because of high levels of unintended pregnancy, an estimated 600,000 clandestine and often unsafe abortions were carried out in 2012, contributing to the country's still high, although declining maternal mortality. These legal rulings come against a background of surveys highlighting the fact that eight in 10 married women in the Philippines want to limit or space their births. Despite this, contraceptive prevalence remains low. Only 38 percent of married women rely on modern contraceptives, while almost half are not using any contraceptive method. As a result, according to the World Health Organization more than one in four births are unwanted. Among the most cited reasons by women for not using modern contraceptives are opposition from religious groups, fear of side effects and lack of knowledge. Abortion continues to be illegal on almost all grounds, except to save the mother’s life. Because of high levels of unintended pregnancy, an estimated 600,000 clandestine and often unsafe abortions were carried out in 2012, contributing to the country’s still high, although declining maternal mortality. The Philippines, now the world’s twelfth most populous country with 102 million inhabitants, is anticipated to continue growing by one million annually. Teenage pregnancy in the Philippines defies the global trend of falling rates. One in 10 Filipino women between the ages of 15 and 19 is already a mother. For years, family planning campaigns have seriously lagged in the Philippines, when compared to its neighbours in South-east Asia. Since 1990, total fertility has only dipped from four to three births per woman. 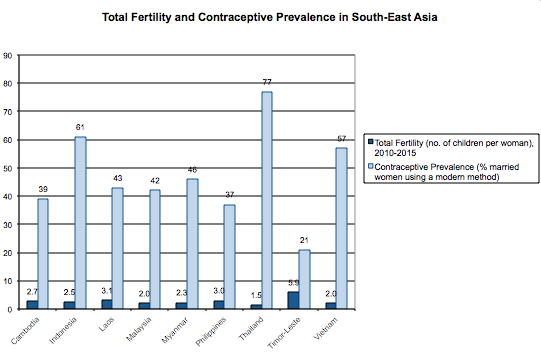 Only sparsely populated Laos and the relatively new nation of Timor-Leste have higher fertility, while only Timor-Leste has lower contraceptive use (see Table). The most recent court decision took place, despite the fact that the newly elected President in his first State of the Union speech, stressed the urgency of family planning for alleviating widespread poverty, currently affecting one quarter of the country’s population. Duterte has also declared that the three child family was sufficient. According to a recent World Bank assessment of the Philippines, economic growth in the last 10 years has been sufficiently robust for creating enough jobs to absorb the growing labor force. However, many of the new jobs are precarious, as well as low-paying and workers often remain underemployed. Opting to work abroad, the remittances sent by the 11 million overseas Filipinos are a stalwart of the country’s economy. The USD 29 billion remitted in 2016 was the third highest in the world. Further riling the waters is a controversial proposal by the nation’s Department of Health to distribute condoms throughout the nation’s public schools, as part of the government’s efforts to stem the spread of HIV/AIDS. 56,000 Filipinos were estimated to be living with AIDS in 2016, one of only a handful of countries where the number of AIDS cases continues to climb. At this point, it is not clear if this proposed program will also be challenged by the Church and thus sent to the Supreme Court for its consideration. In the continued absence of effective, safe, free, widespread and readily available modern contraceptives, it will be extremely difficult to achieve any of the Government’s stated demographic, health and economic objectives. In the case of the Philippines, its destiny now rests on the decision of the Supreme Court and its 15 justices.